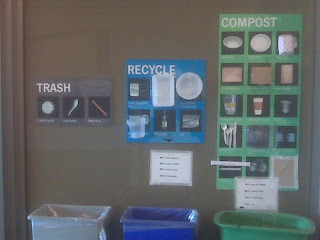 I took this mobile photo of the three different trash bins: trash, compost and recycling, in San Francisco along with the sample boards of what “trash” goes where. 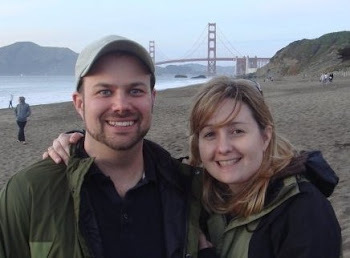 When we moved back to California, I confess that it took some time for me to learn what things go where. This week, we found out that we can now put food scraps and other compostables like soiled paper towels in our green bin along with yard clippings. This is huge for us, Bay Area suburbanites, as now the majority of our “trash” can be composted or recycled. In fact, we bought compostable bag liners for our “trash compactor” (came with the house). It has been quite eye-opening to analyze our trash and see what we are throwing away. Does your garbage service offer composting or do you compost? How do manage multiple “garbage” cans in your house? What makes up most of your "trash"? Our garbage service has included composting for a number of years now. Between that and the recycling service, I hardly have any garbage at all. I actually had a friend over a couple of years ago who was shocked by the size of my kitchen garbage can (it is one of those small, cute bathroom ceramic cans). My garbage can picked up curbside is now the smallest version. I believe it not only takes up less space but also costs less. Typically plastic packaging ends up there. Even with larger home items that I might have once tossed, I am finding people who are in need of them and successfully find homes for them on websites like freecycle. Happy recycling/composting! We are discovering the same thing! Our garbage can is now under the sink and the size of a bathroom waste can too. We'll see how it goes but it's actually pretty eye-opening. Living in a high rise condo we're pretty limited. There are countless bins for paper and glass, but nothing other than the good old fashioned "garbage chute" for perishables that would normally be composted. I suppose I could composte, but in a 10' x 10' kitchen, there's really no room for a composter. less is more here. we have one recycle bin, one compost bin (we empty it into our garden compost in our yard), and only a couple small trash bins. we are able to recycle and compost just about everything and i am working to reduce even that! My city collects food scraps with the green waste, so with that and recycling I hardly have any trash at all (mostly plastic bags and packaging). I put veg and fruit scraps in a covered stainless steel bowl on my counter and empty it periodically (sometimes into my worm bin, but usually into the green bin). Paper-type recycling, unfortunately, gets piled in at least three different places. In July 2008 I went on a tour of the facility that processes green waste and food scraps from San Francisco and other cities. It's a surprisingly complicated and innovative process, which I describe in a report I wrote for The Ethicurean. The East Bay Municipal Utility District (the water company) has been experimenting with a process that digests food scraps to produce methane, which then powers engines and makes electricity. The left-over residue is then composted at another site. Thanks for the comments, Nicola and Marc! And thanks for the great article, Marc! @ Fran...I also live in a condo, and have a cute counter-top compost bin. Our building just started composting when the City forced us to (the excuses I got prior to that were priceless), but it's amazing how much less I carry out in the garbage. When I am out of the house, I store the little bin under the sink so my dog doesn't get into it!